Everyone knows that a good pair of warm gloves is essential for any winter season spent outdoors, whether it’s a pair of warm ski gloves, or gloves for exercising, working or just exploring. Cold fingers can ruin any day out in the icy elements (not to mention how dangerous cold fingers can be), and it’s important to keep your digits warm so that stiff fingers or numb thumbs don’t prevent you from enjoying yourself to the fullest. Just like picking the best ski balaclava, it’s important to choose wisely when looking for winter gloves. We trawled more than 50 gloves to revise a list of the best winter gloves. We tried to provide an array of gloves for different styles, needs and activities; from a range of different price points. Let’s help you choose a pair of super warm gloves for the season ahead. Our favorite warm gloves, are the Hestra Gloves. They’re incredibly well made, stylish, and allow for easy movement. 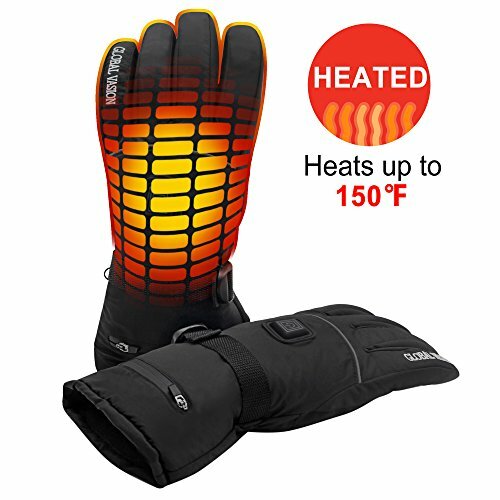 The best heated gloves available are the Global Vasion Heated Gloves, durable, strong, and extremely warm (up to 150 ℉), they will keep your hands toasty this winter. After reviewing some of the best leather gloves, the Hestra Gloves are once again at the top of the list. One of the best pairs of gloves we have ever tried, they clearly strive for quality in all departments. These MCTi gloves are ideal for freezing conditions and are some of the warmest gloves we could find. The extra thick glove and lining prevents any cold getting in, and the waterproofing layers also ensure moisture doesn’t leak in on those long, wet days on the slopes. 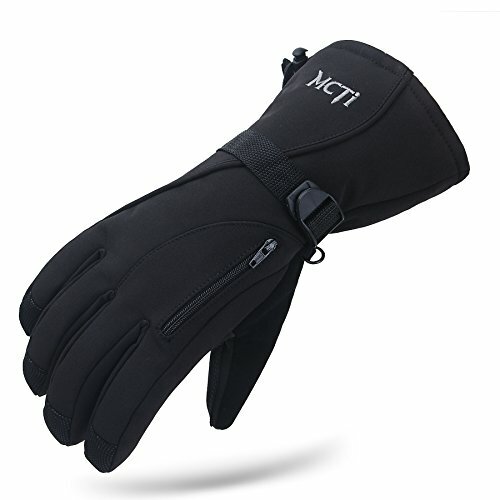 These MCTi snow gloves should be on your winter wishlist. Waterproof, windproof, and incredibly warm, they are designed and built to keep your hands protected against any and all elements. The small zipper pocket is ideal for a small glove-warmer if your hands get even the slightest bit chilly. The gloves come with 40g of 3M thinsulate and 140g of cotton, providing incredible warmth, even on the most frigid of days. The interior of the gloves is made from polyester to absorb and sweat and moisture. 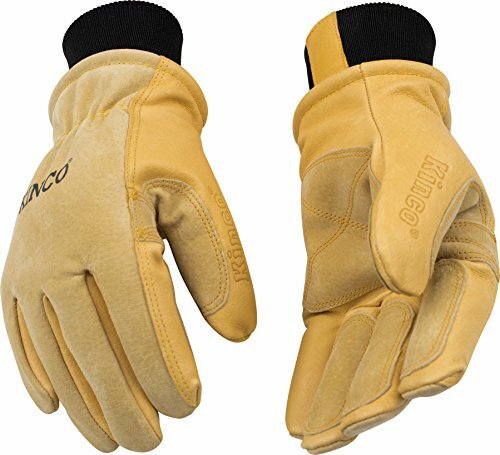 The KINCO 901 is a classic, reliable pair of gloves that can be used for skiing, snowboarding, snow shoveling, or just any everyday activity. Exceptionally well made, and with high-quality materials, means they are a great pair of budget-friendly gloves. The KINCO 901 ski gloves are well known to be a very tough, durable and well-priced pair of gloves. Ideal for winter sports, activities and chores alike. The signature double-layered HeatKeep thermal lining, which is laminated with a soft TR2 inner lining, is designed for maximum heat retention, repels cold, and absorbs moisture caused by sweat, ensuring your hands stay warm and dry all through the day. The pigskin palm and back is incredibly durable and sturdy, and remains flexible and soft even after getting wet, ensuring a comfortable fit no matter the weather conditions. Suede pigskin patches have been added to the palm, thumb and fingers, making these sections extra tough and able to handle wear and tear easily. The KINCO 901 is a trusted model of ski glove that has been used by people the world over, and has been loved by all of them. Reliable, budget-friendly, and designed to last forever, these gloves are a workhorse. Having cold hands and fingers when you’re out on the slopes is a surefire way to ruin any ski day. The Andorra Women’s Touchscreen Gloves come with 3M’s highly effective thinsulate insulation that increases breathability, as well as heat retention, while still keeping the gloves lightweight. You don’t want your ski pole to slip out of your hands while going down a slope, and the textured palm and fingers on these gloves ensure a solid grip no matter what you’re trying to hold onto. 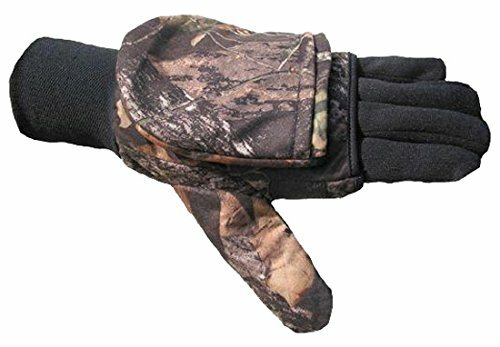 These gloves also have an adjustable strap to fit any wrist width, as well as an extra long cuff that stops any snow or moisture from getting into your jacket. Hestra is known as one of the best manufacturers of ski gloves on the planet, and their Hestra Fall Line lives up to that history and the mark of quality that the Hestra name brings. The glove itself is made from impregnated cowhide aniline, providing excellent protection from the snow and weather, as well as grip, comfort, and most importantly, warmth. They are lined with Bemberg, which is an incredibly soft and comfortable polyester fibre that makes your hand feel like it’s in a cloud. 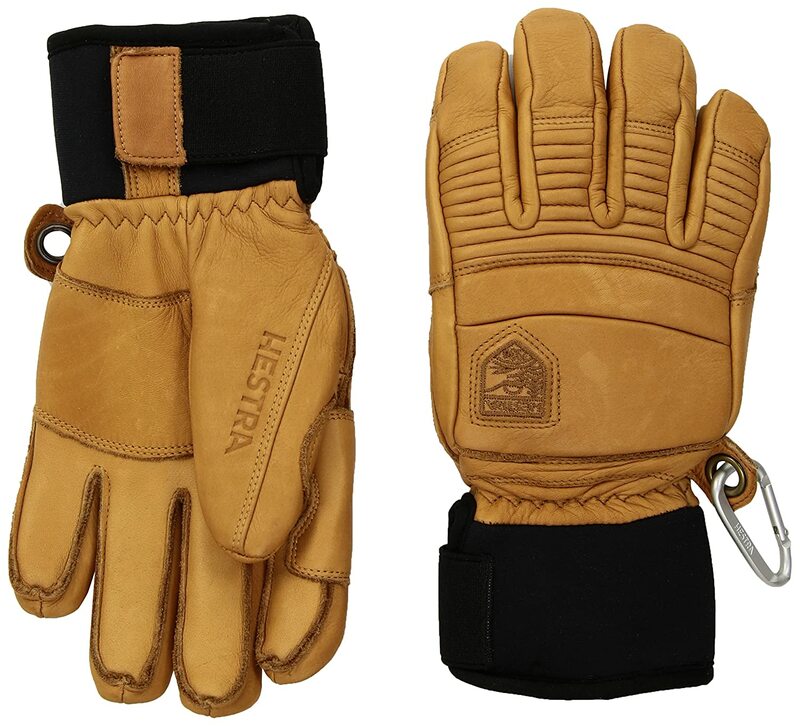 Insulated with Foam/Fiberfill, an insulating material made from polyester fibre that protects your hands from the weather and cold, these Hestra gloves keep your hands warm – trust us. The gloves are made with Outseams Sewing technology, which ensures comfort for your fingers. With an added neoprene cuff as well as a velcro closure, you can be sure no moisture will be seeping into the glove and onto your hands. The quality that Hestra is famous for definitely shines through with these gloves. They may be a bit expensive, but are an investment that will last you many seasons. 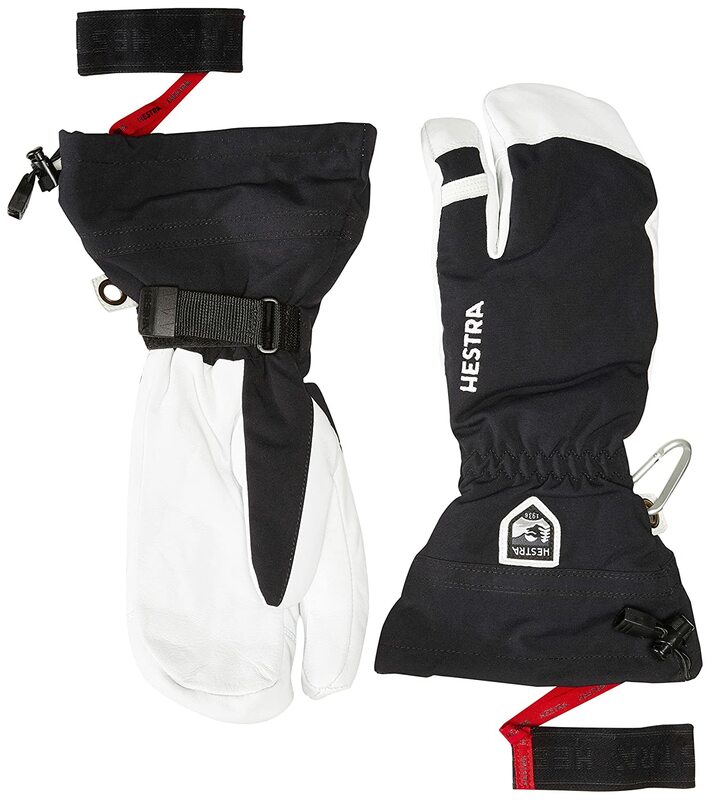 The 3 Finger Ski Mittens from Hestra are luxury ski gloves. Made with high-quality materials and linings, they will keep your hands warm, safe, and comfortable, no matter the activity or the weather. Made with impregnated cowhide aniline, these leather gloves offer you maximum comfort and warmth, and the Hestra label and history remind you of the quality the brand has offered for years. The mittens are insulated with Fibrefill, a polyester fibre that is incredibly warm and insulates your hands against the biting chill of the slopes. This insulation is most definitely of the highest quality, nothing less for the Hestra brand. The gloves are made with Hestra’s Outseam Sewing technology. This technology ensures a ton of comfort for your fingers, without sacrificing any grip or dexterity. The gloves also have a comfortable neoprene cuff and velcro closure, stopping the cold from entering your gloves. Lined with Bemberg lining, they’re incredibly soft and cosy on the inside, allowing for hours or days of use without discomfort. These mittens are a reflection of the quality Hestra is known for, a must-buy if you have the budget. 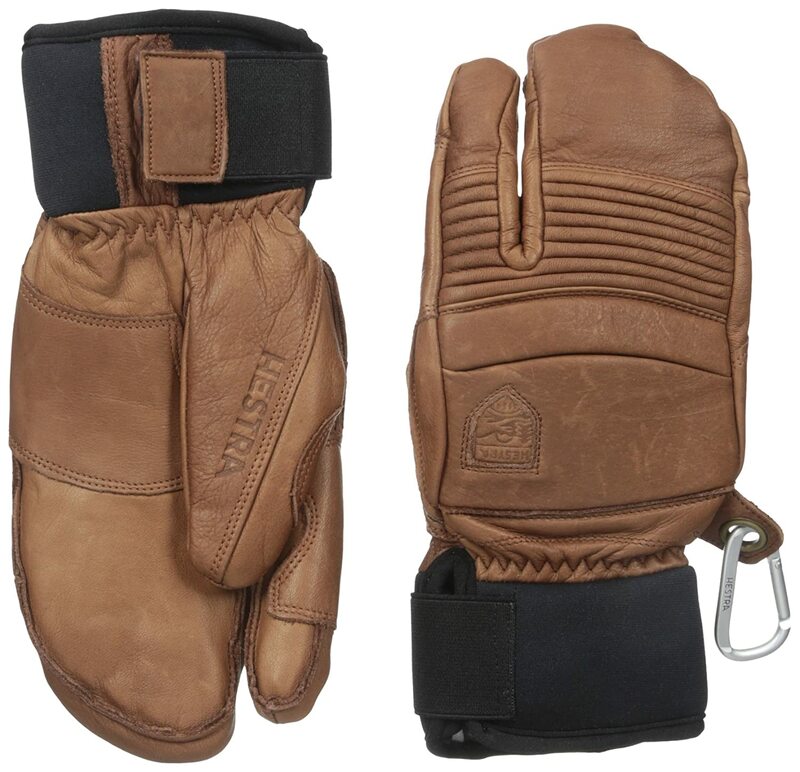 The Hestra Army Leather Heli Ski gloves are made with the attention to detail and high-quality materials that Hestra is very well known for. The gloves are made with Hestra’s Triton 3-layer polyamide, water and windproof fabric – perfect for any conditions and weather that you may encounter while out on the slopes. The palm is made with goat leather – making it tough and offering a lot of durability and grip. The leather makes the gloves ideal for holding onto ski poles, or doing everyday chores or activities. The gloves have a removable Bemberg liner, which is incredibly soft and cosy, making them easy to remove for cleaning, or to replace when the lining runs thin after a few seasons of use. They are also designed with Eagle Grip technology, meaning minimal excess material and a very close, form-fitting, ergonomic design that fits your hand perfectly. 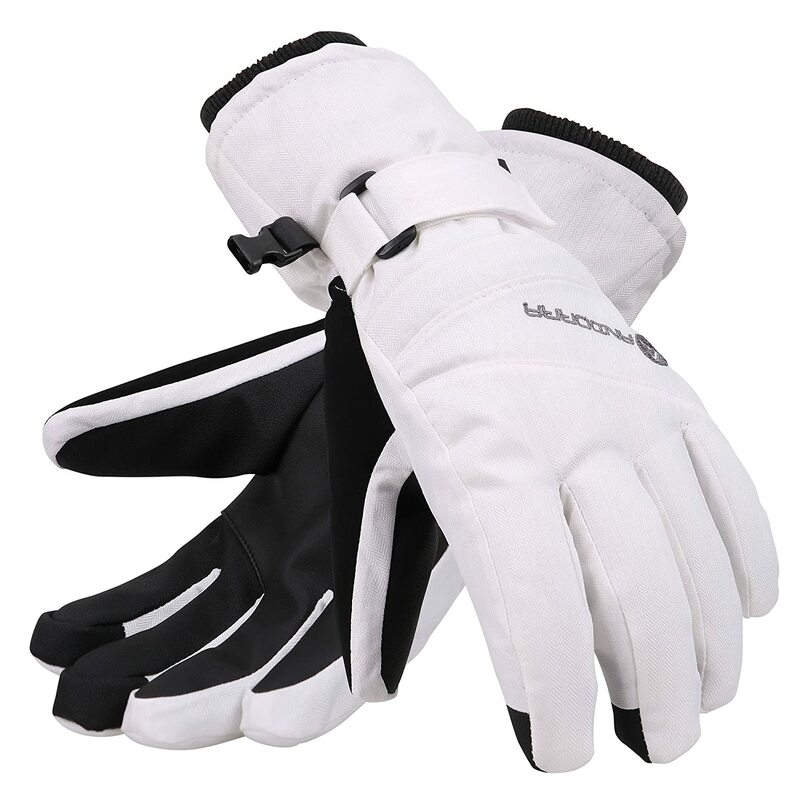 The gloves also have a snow lock and a velcro closure, to keep any snow, moisture, or cold out. With carabiners and handcuffs to ensure they stay on while in use, you can also niftily hang them from your pack when you’re not wearing them. The Global Vasion Heated Gloves are going to be your next best friend in winter. You never have to worry about cold hands again with these heated gloves. 3 heat settings mean you can keep your hands at your desired temperature, and the long-lasting charge will keep your hands warm all day long. The Global Vasion Heated Gloves have an excellent outer water-resistant shell, meaning even snow or moisture won’t be able to freeze your hands. They will stay warm and toasty, regardless of the conditions. The upgraded, 80% cotton lining is incredibly comfortable as well as adding grip. These heated gloves are designed to increase blood flow in the hands to stop them from going numb in the cold. Nothing will ruin a day out on the slopes quicker than ice-cold hands and these gloves will stop any chance of that happening, while still allowing full mobility. Warm gloves are a must during winter, however, this heated pair should be at the top of your wish list if you are exposed to incredibly cold temperatures on a regular basis. Use them for skiing, snowboarding, work outside or around the house, or even just for the walk to work. The Verseo Electric ThermoGloves are the perfect combination of heated gloves as well as heated liners. These gloves are able to keep your hands warm on their own or can be used as heated liners inside your regular gloves. This combo makes them ideal for anyone who already owns a pair of ski gloves they love or someone who just needs that extra bit of warmth. With multi-purpose functionality, they can keep your hands warm whether you are snowboarding, skiing, cycling, doing work outside or just as hand warmers on frosty nights. Being liners, they are also not as bulky as regular heated gloves, therefore they won’t restrict any mobility. They may even be some of the best gloves for shovelling snow. There aren’t any exposed wires or pads and they are very compact. They are charged with ion batteries that are also water and weatherproof, so there’s no need to worry about severe weather conditions shorting out your gloves. These gloves are even better for those who suffer from arthritis or any condition that limits blood flow to the hands. The heat will keep the blood flowing and stop your hands from becoming numb, and they will help ease the pain associated with arthritis in cold conditions. These Heat Factory Gloves feature a sewn-in, fold-back mitten pocket allowing you to wear them either as extra warm mittens, or normal fingered gloves. This ensures your hands always stay warm no matter the activity. The gloves are a bit bigger than most heated gloves but are just as warm and comfortable. Use the mitts to keep your fingers and hands warm, and then just flip the mitten part back when you want to grab onto a pair of ski poles or some tools outside. These are ideal if you’re finding your current gloves are either too cold, or not mobile or versatile enough. With this guide, you should be just about ready to invest in a quality pair of super warm gloves for the winter ahead. You’re spoilt for choice, so it remains up to which pair is best for you and suits the needs of your activities the most. These gloves will pair well for any winter travel with a good pair of goggles and some heated socks. Remember, once you’re on the slopes you can always take extra layers off, but you can’t put extra layers on (if you didn’t bring them).